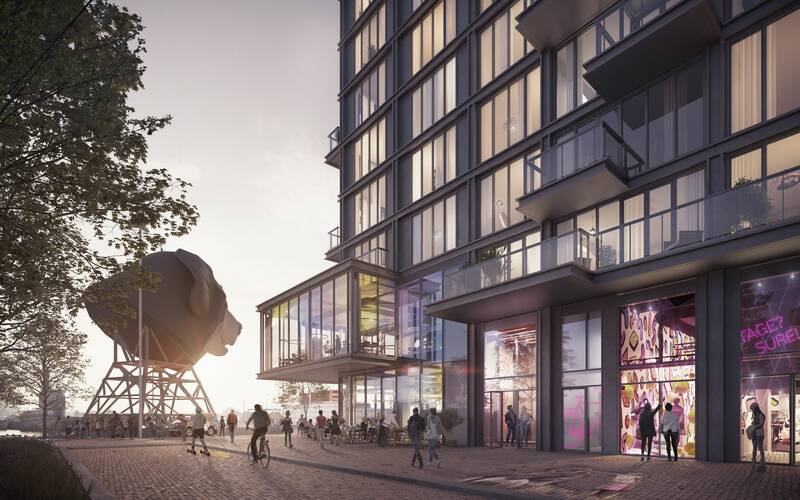 At the NDSM wharf, a mini-city is emerging in a city: on the west side alone 2.100 homes are added in the near future. The NDSM experience is a different one everyday, with an always changing cultural mix and lots of events. The ferry boat between Amsterdam CS and Houthavens delivers a constant flow of residents and visitors to and from the NDSM wharf. Albert Heijn has already been registered as a tenant for unit 8 in Pontkade. The 3 remaining retail spaces of approx. 120-220 m2, located on the Ms. Van Riemsdijkweg, are available for entrepreneurs who have strong and distinctive retail in their DNA. The high spaces with lots of glass and therefore natural light, are right on the Ms. Van Riemsdijkweg and at the ferry boat service. Are you or do you know a professional entrepreneur who wants to put something unique on the NDSM shipyard? Let’s have coffee!